One of my favorite combinations is tomatoes, basil, and a yummy balsamic reduction. Throw some cheese and kosher salt in there and it’s even better–but I’ll take it or leave it. Since summer is nearly here and I’m finally going to stick to a diet, I’ve been firing up the grill almost every day for dinner. Barbecue grilled chicken tastes so much better to me than indoor grill pans so yay for warm weather! Plus it’s pretty healthy so it’s a win. This recipe I threw together tonight for dinner was super fast and easy. I like to grow my own basil (because it’s easy to grow indoors and way cheaper than buying it at the store) so I always have that on hand. I usually have tomatoes and chicken too. Today I decided to buy a balsamic glaze reduction rather than making my own. Last time I made my own, it took almost an hour and stunk up the entire house. So I paid a few extra dollars for a reduction–which you can find next to the balsamic vinaigrettes. Just look for ‘reduction’ on the bottle and tip it to test the viscosity. It should be thicker, more like a syrup. Marinate your chicken breasts in the Italian salad dressing for several house. Before you grill, butterfly the breasts by cutting them in half on the horizontal. 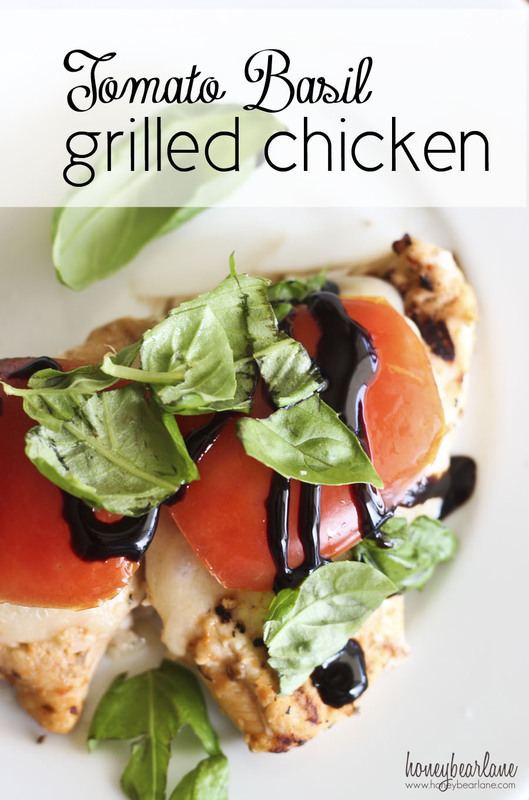 Grill your butterflied chicken breasts until cooked through. Meanwhile, slice your tomatoes and chop the basil. Salt the tomatoes. Cut each slice of cheese in half to fit the size of the chicken breasts. During the last minute of grilling, add the cheese to the top and cook until it's melted. 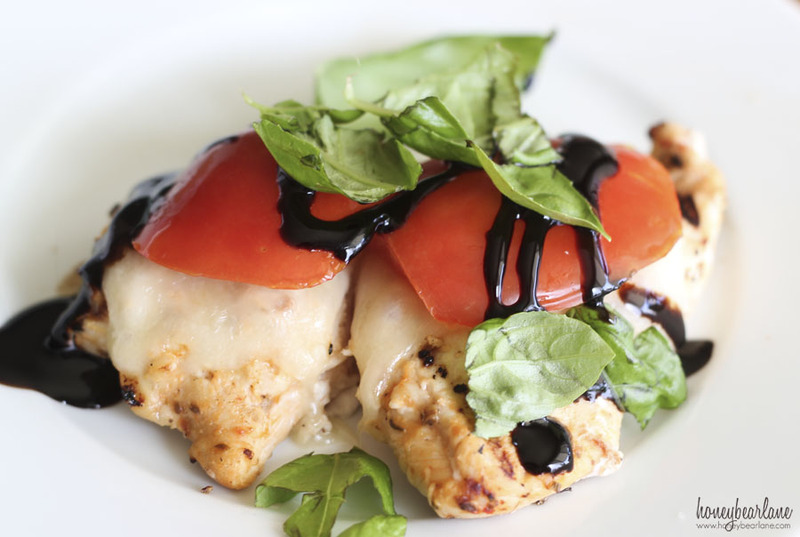 To serve, place the chicken with melted cheese on the bottom, then layer a salted tomato and top with basil. Drizzle the balsamic glaze over the whole thing. This meal would be awesome for entertaining–seems impressive but is so seriously easy (especially if you buy the balsamic reduction sauce!) I think it would taste great with some roasted vegetables and a berry salad. Seriously, I saw the picture and started drooling. I too LOVE this combination! Do they have Cosi in UT? It’s this salad/sandwich place and they make a tomato, basil, mozzarella sandwich that I get every time I go. And they bake their own flatbread, which makes it even more delicious.